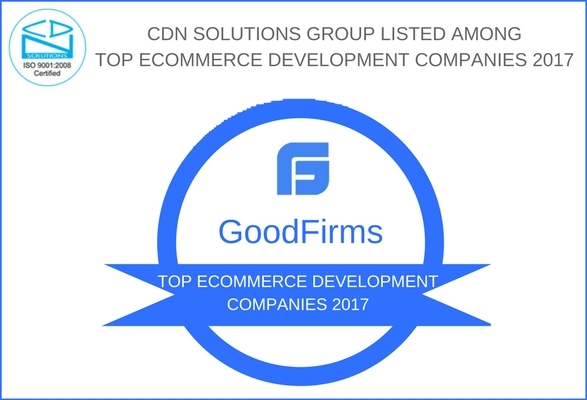 After bagging awards and recognition in various relevant categories, top IT outsourcing company CDN Solutions Group has yet again listed under Top e-commerce development companies 2017 list released by GoodFirms, a full-fledged research and review platform. GoodFirms, just as the name suggests, is a dedicated community of “performing” software development companies as well as software design and marketing companies. Just for our new readers, CDN Solutions Group has earlier been listed among Top enterprise App Development Companies 2017, Top Custom Software Development Companies, Top IoT App Development Companies, Top Magento Development Companies by top notch research firms like Itfirms, Clutch.co, Top App Creators, Top design firms. And now this time, the top IT research based firm GOODFIRMS listed us in its recent issue i.e. Top eCommerce App Development Companies 2017. This year, we have developed major eCommerce solutions implementing features such as virtual sales assistance, organised return process, increase security measures, Internet of Things, Online store optimised for mobile, and last but not least Augmented Reality and Virtual reality. So this year again we fulfil our motive of Consistently Delivering Quality Solutions. This is not the end of appreciation, we are hoping some more awards in different categories from top research firms for the work and progress we have achieved this year.